A history of the ordinary British soldier in the First World War. Richard Holmes deploys his skills of historical analysis to tell the human story of the men that comprised the British army. The first history of the First World War to put the British soldier who fought in the trenches centre-stage. This superb and important book tells the story of this epic and terrible war through the letters, diaries and memories of those who fought it. Unmissable. The First World War is deeply dug into the consciousness of the British. The images it conjures are of blood, barbed wire, shell-holes filled with dead bodies; of subalterns with wispy moustaches who never had the chance to grow old; of soldiers with faces vacant with shell-shock; of great aunts who never married. Holmes, one of Britain's foremost military historians and TV presenters, broke new ground when he published Redcoat: his history of the British soldier 1750-1860. 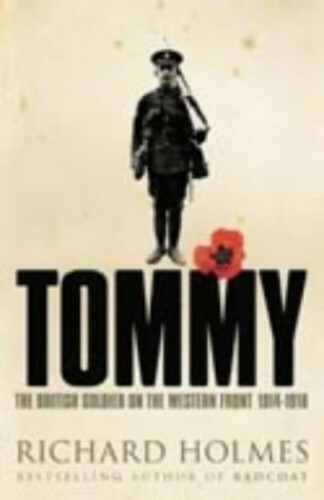 Now in the same inimitable style, Tommy tells the story of the First World War through the experiences of those who fought it. Over 6 million men served in the British army (22% of the adult male population). Nearly one million lost their lives and over 2 million were wounded. This is the story of all these men, and the women they left behind. By using completely unseen letters, diaries, memoirs and poetry of 1914-1918 to complete his picture of the generation that fought and died in the mud of Flanders during the First World War, the life and character of Sgt Tommy Atkins is cast. Richard Holmes quotes many who wrote at lunchtime and died before tea; of women who lost husbands and brothers in the same afternoon and those who's mental health was destroyed for ever by shell shock. He examines their motivation, the impact of their service, their attitudes to war and to the enemy, and ultimately the legacy of their experience. This book covers completely new ground and the result is a moving testament to the courage and sacrifice of a generation. It tells -- for the first time -- the real story of trench warfare, the strength and fallability of the human spirit, and the individuals behind an epic event. It is an emotional and unforgettable masterpiece from one of our most important historians.